Mike Garofalo was the Manager of Piping Engineering and Design at Fluor Corporation’s Southern California Division from mid 1954 till 1980. He did more for the piping profession in that company than anyone I know of. Though he was the Piping Manager in the Southern California office only, his influence was felt by and affected all the other Fluor offices around the world. He was a true visionary leader. More than that, he was also a caring and compassionate professional and teacher. I started my career in Piping and at Fluor the same year (1954) he became the piping Manager and was a student in one of the evening piping classes he taught two nights a week at the local junior collage. One of the most important things that Mike did during his early years was to keep in touch with all the jobs and all the pipers in the Southern California office. He would make a weekly “walk-around” through all the projects and talk to some of the piping people. He would not talk to every piper every week, (there were just too many) but he would randomly stop and talk to a few pipers on each job. There are a lot of stories that could be told about him but I want to talk about his words, “In piping there is a reason for everything.” I first heard these words when I was working on a project as a young piping designer. This was during the time when the other kind of 3D design model was being built. That 3D Design Model used wood and plastic for the structures and equipment, with brass wire and specific sized rubber sleeves for the pipe. We had valves cast out of a material much the same as solder and we soldered them to the brass wire. The Piping Designers did all the model piping. There came a time when the model board I was working on was about 90% complete and Mike showed up for his weekly walk-around. On this particular day he stopped at my table and looked over my work. He greeted me and I, shaking a little, greeted him in response. He then proceeded to point to a specific line and ask, “Why did you route that line that way?” Needless to say I was a bit flustered and my response was “I don’t know”. Now Mike was a full head taller than me and out weighed me by at least 150 pounds. He was Italian and looked stern. After my answer he turned red and I swear I saw steam come out his ears. I was sure that I had just made a classic career-ending mistake. But no, he proceeded to pull up a drafting stool and sit down beside me. He lowered his voice and taught me the most valuable piping lesson of my career. He went on to say “Today it was me that asked you this question, but what if it had been the Client?” He went on, “What do you think he or she would have thought? You see there is always a reason for routing a line a certain way or placing a valve in a certain place.” We talked for some time about this approach to piping before he said “Keep up the good work” and then left. I have remembered that lesson and used it throughout my career. It would have been good for all pipers to meet Mike. But sadly he is gone now. However you can all read and learn from his words: "In Piping, there is a reason for everything!" What did he mean? Consider this; you have a line on a P&ID that runs from point "A" to point "B". This line has a valve at the start point, a Meter run and a Control Valve (CV) manifold then connects some distance away to another piece of equipment with a Valve. · There is a reason the line runs from point "A" to point "B". Check the P&ID, find out the reason. · There is a reason the line starts at that elevation and in that specific orientation relative to North. · There is a reason for the type of connection. · There is a reason for the line size. · There is a reason for the specific material. · There is a reason for that valve that is required at the point "A" nozzle. · There is a reason for that meter run. · There is a reason for the routing of the line between the end of the Meter run and the CV manifold. · There is a reason for the specific location of that CV Manifold. · There is a reason for the specific configuration of that CV Manifold. · There is a reason for the routing of the line from the CV Manifold and the final end point "B"
· There is a reason for the larger line size of the line downstream of the CV Manifold. · There is a reason for the "Do Not Pocket" note on the P&ID for the pipe downstream of the CV Manifold. · There is a reason for the line size block valve at the inlet Nozzle at Point "B". In addition to the issues that are specific to the line and it's components there are issues such as Safety, Support, Operator access and Maintenance access for the Valve at Point "A", Point "B", the Meter Run and the Control Valve that will need to be provided. This means conversation and coordination with the Structural Engineering and Design Group. 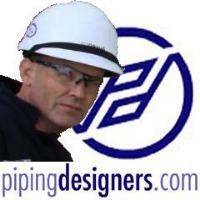 To be able to "See" all of this and "Translate" all of this from a P&ID into a "Piping Design" is vital to the success of, and livelihood of a "Good" Piper. To be a good piper you need knowledge (data and information), intelligence (Training & Experience) and wisdom. Wisdom is knowing the reason.